When one goes out and buys a Veggetti after seeing a commercial, one is inclined to also purchase several, rather large zucchinis because one is so excited about the aforementioned Veggetti. But then one gets sick of eating zucchini "pasta" and is forced to find other uses for all the zucchinis that are hanging out in the vegetable bin. 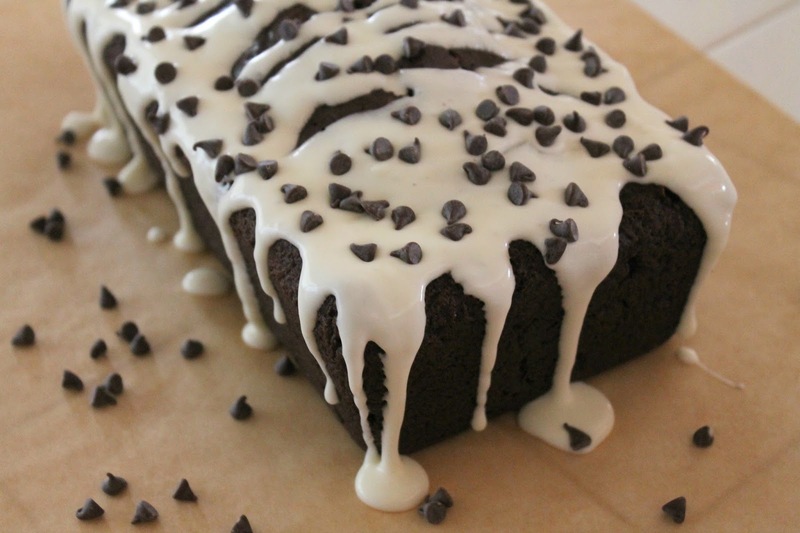 Like chocolate zucchini loaf! Originally, I set out to make zucchini brownies, but after extracting from several different recipes to create my own, I ended up with a cake (albeit a delicious one). 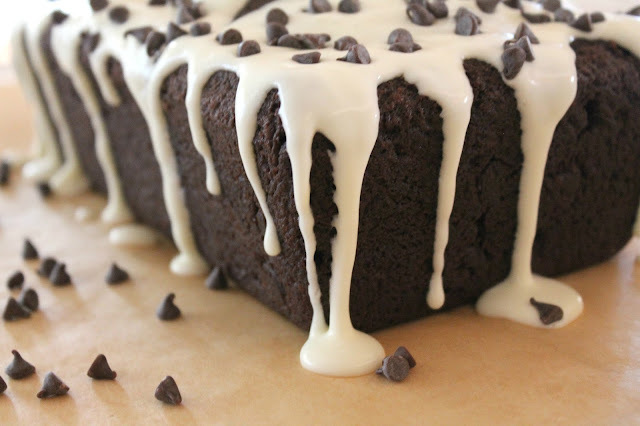 Round 2, I baked my chocolate zucchini batter in a loaf pan and topped with a simple glaze and mini chocolate chips, and the results were perfect--a soft, tender cake with just the right amount of sweetness to balance the rich chocolate. And if I ever want to make it dairy-free, I can just omit the glaze and this loaf cake will still be fantastic. Preheat oven to 350° and grease and flour a 9x5 loaf pan. In a large bowl, mix together the oil, sugar and vanilla until well blended. Combine the flour, cocoa powder, baking soda, and salt, then stir into the sugar mixture. Gently fold in the zucchini and chocolate chips. Bake for 55 to 60 minutes, or until cake springs back when you gently press on the top. To make the glaze, whisk whipping cream and confectioners' sugar together until creamy. Drizzle over cake once it's completely cooled, and sprinkle with mini chocolate chips.